Thousands of years ago, the Chinese discovered that the human body was flowing with an energy they called Qi (pronounced “chi”). They mapped out the network of pathways on which it flowed. These pathways are called meridians. The flow of Qi is essential to good health. In a healthy body, it flows smoothly. If that flow is disturbed, disease may result. The meridians connect certain organs together to create balance. Every yin organ is paired with a yang organ – liver with gall bladder, lungs with large intestine, kidney with bladder, stomach with spleen, heart with small intestine, and so on. The meridians likewise connect each tooth to specific organs. The easiest way to see the meridians connecting the organs and teeth is to consider one tooth at a time. 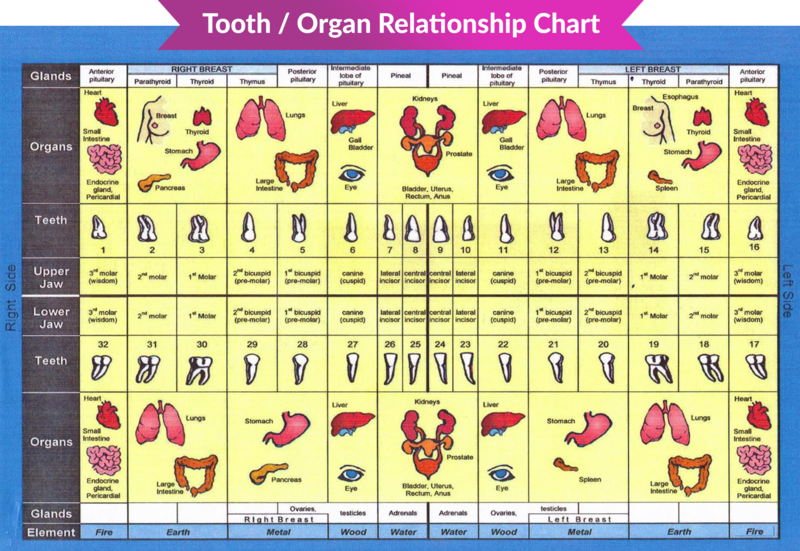 Looking at a meridian tooth chart below, you will find the appropriate tooth and the corresponding organ. Every tooth has a meridian going to it. There are 12 meridians in total, and each of the 32 teeth are represented on them. The meridians can be affected such as a maxillary six-year molar with a root canal could be the cause of a stomach problem, or the stomach problem could be affecting the six-year molar. Functional Dentistry, is where certain health problems are found to originate from dental conditions that are reflecting to a specific organ that is also affecting the overall health of the patient. Functional Dentistry Practitioners may decide to look at the meridian chart during a new patient exam, to assist in the diagnosis and suggested treatment plan for their patients. It is often amazing to see the connection!